Where Are the Young Home Buyers? *This is a cross post of something I wrote for the day job. Given that job growth has accelerated notably in 2014, with a much higher share being created in higher-paying sectors, these trends in income and net worth are bound to start improving to some degree. Though, considering that the appreciation of median home prices has vastly outpaced wage growth over the past decade, many in the Millennial generation will likely continue to find it more difficult to qualify for a mortgage than Generation X did 10 years ago. The “decoupling” is the divergence between labor productivity and employment/wages that happened in the US in the 1980s and has become quite pronounced over the past thirty years. 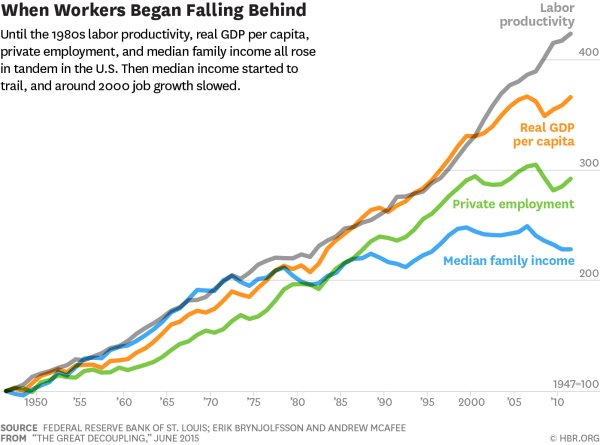 During the great postwar boom, productivity and wages grew in lockstep in the US. Of course, we don’t see any data from the 19th century and the first half of the 20th century so it’s not clear that labor and wages have always grown in lockstep. But something certainly changed in the 1980s and the result has not been good for median family income which has been stagnant in the US for almost thirty years now. This is the kind of shift that does not happen overnight, and if that trend is to reverse it will not happen in a matter of years but in decades. What that means for rental housing providers in particular is that the falling rate of home ownership could be the new normal for a generation to come, which is good news for their businesses. On the other hand, if real median household income continues to decline then the demand for market rate units could stall and the demand for affordable housing units could skyrocket. Obviously some policy changes could change this outlook. For instance if lending standards are relaxed again and if more affordable single family homes are constructed, then rental demand would obviously be impacted. Considering the lessons we learned when the housing bubble popped that first if is pretty big, and given the persistent problem of slow income growth any growth in home construction we do see probably won’t come close to what we saw in the late 90s through mid 00s. Long story short – rental housing should continue to grow for the foreseeable future. This entry was posted in Current Affairs, Economy, Real Estate and tagged home buyers, housing, millennials, real estate on May 28, 2015 by Jon Lowder.